Elise Chenier leading activity at “Who Tells Your Story?” Photo Credit: John Andries. The following recap was composed from notes taken by Michael Caroll during a breakout session discussion following “Who Tells Your Story? An LGBTQ Community ArchivES Forum” at William Way LGBT Center, Wednesday, March 13, 2019. The forum opened with panelists Elise Chenier (Director, Archives of Lesbian Oral Testimony), Steven Fullwood (independent archivist and founder, In the Life Archive, Schomburg Center for Research in Black Culture), and Che Gossett (archivist, Barnard Center for Research on Women) discussing their work on collecting and preserving the histories of lesbians, queer African Americans LGBTQ, and transgender persons. After the forum, attendees discussed the representation and role of resistance in the archives. Attendees defined resistance much the same way audience members at other listening sessions have: as both everyday practice and as archival material. For individuals in communities where oppression presents challenges on multiple levels or makes life particularly difficult, joy, turning to the mundane, or refusing to be invisible can be forms of resistance. Resistance can be found in materials or information that haven’t been filtered through the mainstream. Though archivists are trained in verification methods that can privilege men and heteronormativity, they must be sensitive to the original context of materials collected by the LGBTQ community. The archivist can practice resistance by carving out space for materials removed from mainstream methodology. Archivists also can support community resistance by being more directly integrated into these efforts. They can, for example, actively document ongoing resistance or facilitate intergenerational conversations. In general, participants viewed archives much like they do libraries: as informational outlets with valuable documents. Archives are institutions to glean knowledge from, but not necessarily add knowledge to. While participants expressed a desire for their stories to be preserved in traditional institutions, they also acknowledge a need for archivists to find ways to help people collect and preserve their histories/experiences in a safe way that does not incriminate them. 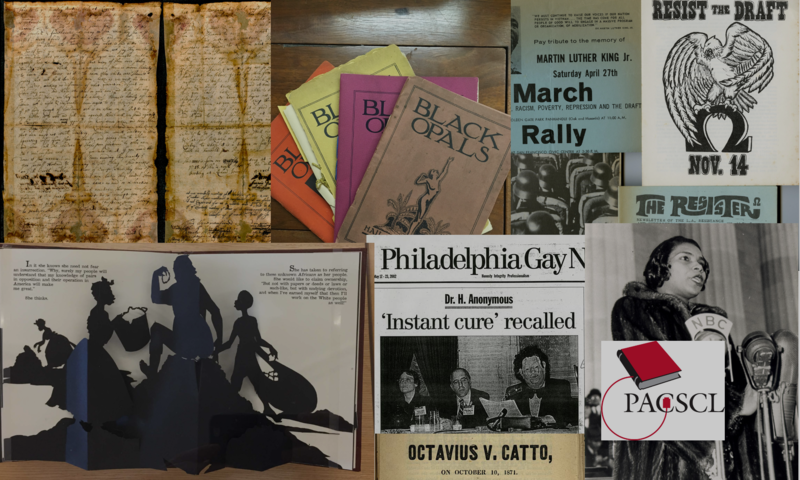 People who identify as LGBTQ sometimes need to remain “closeted.” Archives can achieve this balance and ultimately enrich their collections with more diverse stories by building trust and relationships with the communities they serve. When community members feel free to participate, then they are more willing to engage. 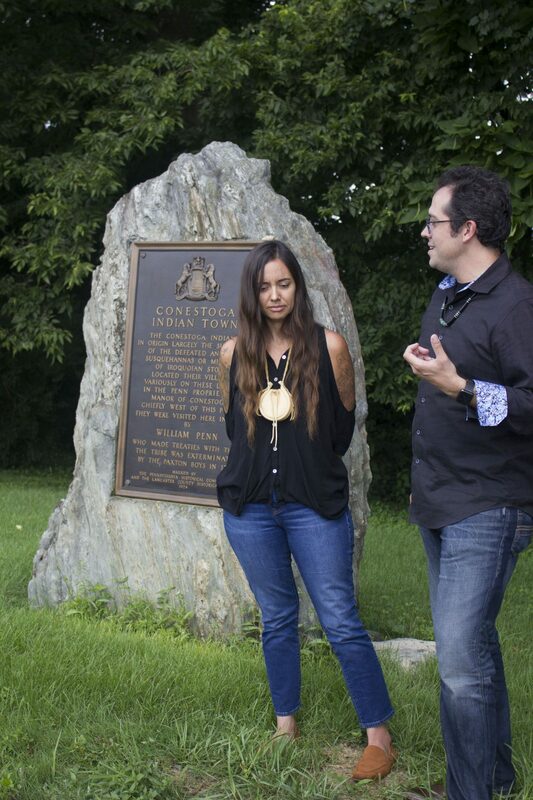 Artist Weshoyot Alvitre (L) and author Lee Francis stand beside the historical marker commemorating what was Conestoga Indian Town during a research trip in August, 2018. Photo courtesy Library Company of Philadelphia. I ended part I of this two-part blog series with the question, ““[I]n 25 to 100 years, what will hold more weight to people looking back at this moment—viral, instantaneous postings, the next-day regrets of experienced journalists, or Nathan Phillips, an indigenous man, in his own words?” I wondered this because as I saw the confrontation at the Lincoln Memorial unfolding last month and thinking about how the acts of resistance and counter-resistance would be preserved and remembered, I was also thinking about Digital Paxton. Launched in 2017, Digital Paxton is an online collection of nearly 20 institutions’ materials related to the massacre of the Conestoga Native American tribe in Lancaster, Pa., in December 1763. A mob of white settlers who came to be known as the “Paxton Boys” descended upon the Conestoga and murdered 20 unarmed Susquehannock Indians. Though Digital Paxton boasts nearly 3,000 documents, “materials that give voice to Conestoga, Lenape, or Moravian Indians … are almost always mediated through colonial sources,” said Will Fenton, Director of Scholarly Innovation at Library Company of Philadelphia (LCP) and founder of Digital Paxton. For example, the Quakers often quote Lenape leaders verbatim in their minutes from conferences with the tribe. We live in a time when historians understand representation matters to people of color, social studies teachers know the point-of-view of the winner isn’t an accurate overview of history, and when the most marginalized groups in U.S. history are exerting more control over the telling of their own stories. But how do Native peoples relay that history if the kind of primary sources archivists have put a premium on weren’t written by Native Americans? Redrawing History: Indigenous Perspectives on Colonial America attempts to step into that gap. Managed by LCP and funded by the Pew Center for Arts & Heritage, Redrawing History is a collaboration among scholars, artists, and tribal leaders that reinterprets the story of the Paxton massacre from the perspective of Native peoples and spreads the knowledge of it to a wider audience. 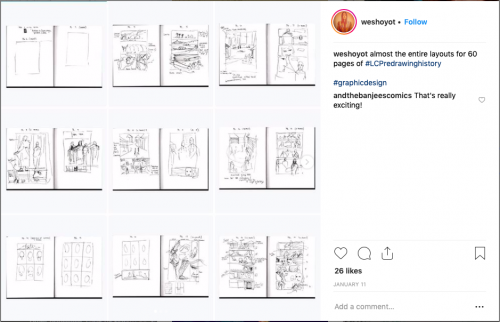 The project’s main method of sharing will be a graphic novel written by Lee Francis and illustrated by Weshoyot Alvitre, both of whom are Native American artists who have worked together previously on historicized fiction projects, such as Tales of the Mighty Code Talkers, a graphic novel that received the American Indian Library Association’s (AILA) 2018 American Indian Youth Literature Award for Best Middle Grade Book. 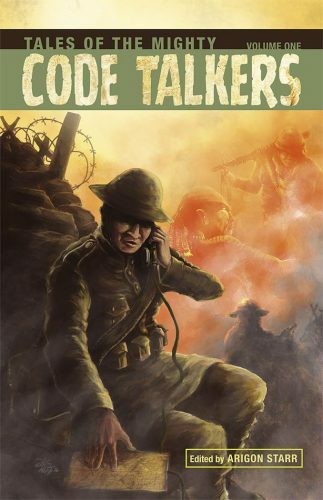 Lee’s publishing company, Native Realities, published Mighty Code Talkers. He is also the founder of Indigenous Comic Con and owner of Red Planet Books and Comics. The process of creating a graphic novel that’s also historicized fiction can be summed up this way: research, write, draw, revise, print. But the research step is complex, important, and detailed. “I’m working with tribes that aren’t my own tribe,” said Weshoyot (pronounced Weh-shoy-o). Weshoyot is a member of the Tongva tribe, a nation whose land base was the greater Los Angeles area. She lives in California. Lee is Pueblo of Laguna and lives near Albuquerque, NM. 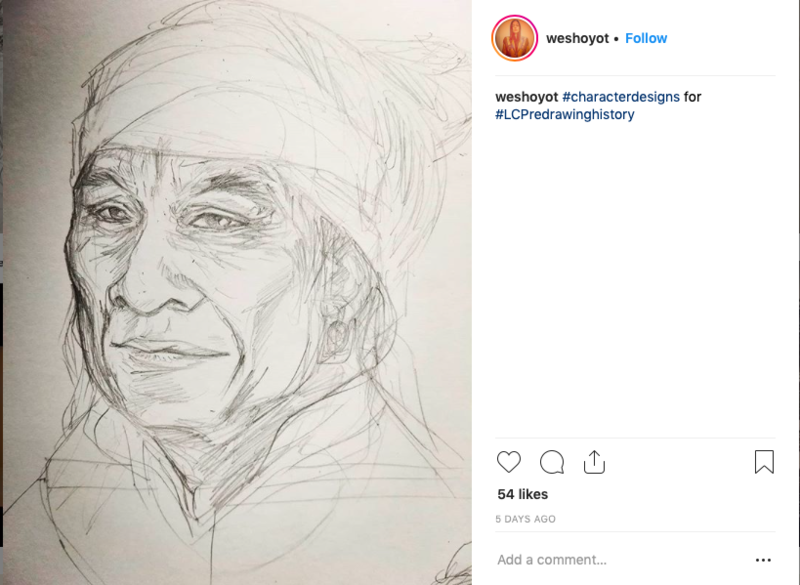 Weshoyot feels some additional pressure to accurately represent the story of another nation, though she and Lee see parallels with many Native tribes’ respective histories. Lee pointed to the Sand Creek Massacre in Colorado in 1864, when the U.S. Army killed 230 Cheyenne and Arapaho Indians along Sand Creek. The Tongva, Weshoyot’s tribe, is not federally recognized, but was also the victim of genocide—initially by Spanish colonists (the land was part of Mexico until the Mexican-American War) and then by white settlers pushing into the West. The Tongva’s population dropped exponentially from an estimated 5,000-10,000 people in the late 1400s to 700 at the turn of the twentieth century. “I think this [history of genocide] gives me a level playing field for handling [another tribe’s history] respectfully but also doing it with a backbone, giving a a voice that hasn’t been presented before,” said Weshoyot. Genocide, however, is not the end of the indigenous American story. Weshoyot and Lee want to show a story of survival. “Despite the massacres that tried to eliminate us, we still exist,” said Lee. 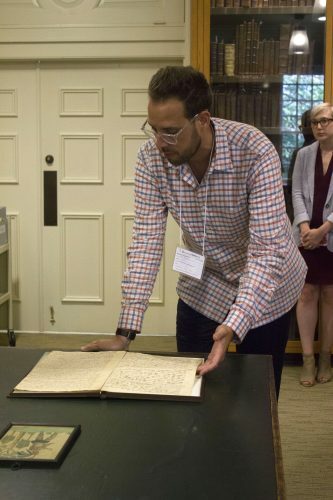 Creative director Will Fenton curates historical materials at LancasterHistory.org during a research trip in August 2018. Photo courtesy Library Company of Philadelphia. 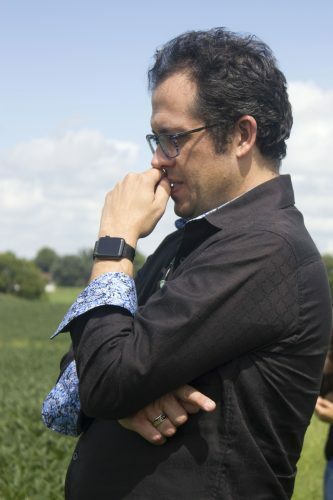 After Will Fenton reached out to Weshoyot and Lee, he connected them withmembers of the Native community in Lancaster and the Circle Legacy Center, a Native American nonprofit organization there. Redrawing History’s advisory board also includes prominent scholars (Daniel Richter at Penn), curatorial experts (e.g. Vilma Ortiz-Sanchez at the Smithsonian Museum of the American Indian), and indigenous ambassadors (Curtis Zunigha, co-director of the Lenape Center and member of the Delaware Tribe in Oklahoma). With the input of the local indigenous community, historians of the Paxton massacre, and people whose ancestors survived it, Lee and Weshoyot “have worked backwards from the sense that Native people still exist. These were people who had agency, who stood up, who were heroes in their own right,” said Lee. The murdered Conestoga men and women were also human. “The extent of their representation has been their names in history books, but I really want to flesh that out a little more,” said Weshoyot. Screen shot of Weshoyot Alvitre’s Instagram page, taken 21 Feb 2019. The details help solidify the fact that Native people had established a way of life prior to colonizers arriving—-a way that continues to be challenged today in situations like the fight over the Dakota Pipeline, when Native land is within the path of economic development. In the jailhouse where the massacre occurred, Weshoyot sees a striking metaphor for colonization and continued environmental threats. “In Native cultures, rocks and land are just as important as people are,” but “a foreign entity came in and drilled out the [existing] stone to make it a jailhouse,” an act that represents how society is broken apart and put back together for something else, Weshoyot said. Today, the building is, somewhat ironically, a theater. Weshoyot pointed out that something dramatic continues to happen there, but the history of the building and the previous importance of the stone is disconnected from the rest of the land and from the people. For Weshoyot, the construction of the jailhouse has helped her emphasize Native folks’ humanity. “I try to imagine myself in the space. If you slow down time and put yourself in the perspective of anyone in this situation—it was in the wintertime. It was cold, it was snowing. They were already traumatized and were huddled together into the basement of a jail made of stone,” she said. “I think the brilliance of what we can do with [a graphic novel] is to reconstruct how people would have reacted in those circumstances. … They died standing up. They faced their attackers eye to eye. That’s one of the things we can show with a little bit of historical amalgamation,” said Lee. With regard to portraying a historical event in a fictive space, the Redrawing History team is inspired by Saidiya Hartman’s work on critical fabulation “as a means to creatively imagine what might have happened, ‘to imagine what cannot be verified … to reckon with the precarious lives which are visible only in the moment of their disappearance.’” For Lee, this means maintaining “a good, noble balance, a beautiful conflict to make sure we are telling the stories in a way that do honor [to those who were massacred] but project something positive into the world.” He and Weshoyot are also grateful to Will, LCP, and Pew for seeking out trends in Native pop and visual culture and for being open to finding new ways to represent Native voices. 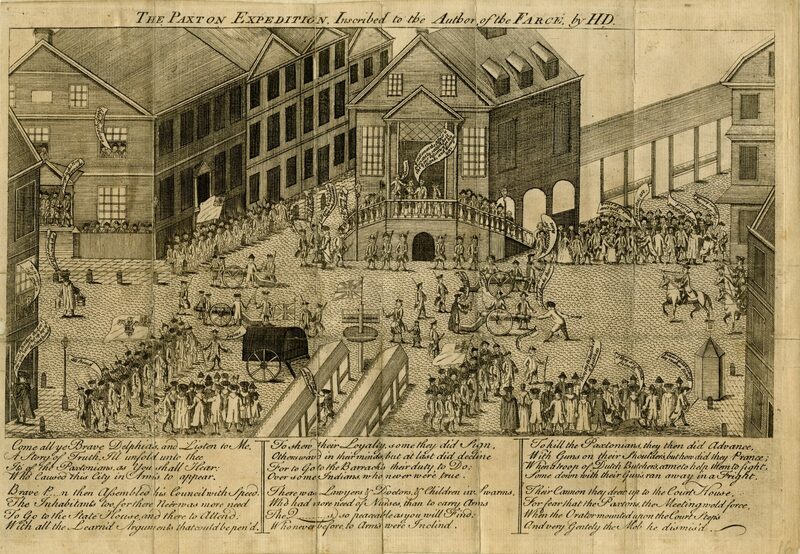 An eighteenth-century political cartoon available on Digital Paxton, the inspiration for and basis of the graphic novel. Image courtesy Library Company of Philadelphia. While the vast majority of materials in Digital Paxton are written from the perspective of whites who were either allies or Paxton sympathizers, Lee has preserved the Lenape language in the script whenever possible and also has quoted lines directly from some of the political cartoons in the collection. He noted that Native people likely saw themselves represented in mass media and spoke out about how they were portrayed. In the media, Lee said, Native people were used as props. “We wanted to place Native people at the center, to show their agency and that they were still people. A group of people were used as political cartoons, props, propaganda. We want to focus on the experience, and that has resounding current-day parallels,” said Lee. He compared the way Native people were depicted in the 1870s with how refugees from Syria or asylum-seekers from Central America are being portrayed today. They’ve become political tools, “but what about the people who are actually there, the people who have the agency because they choose to walk, even though they are herded into a place and facing their extermination?” he said. Author Lee Francis looks out at what was the site of Conestoga Indian Town during a research trip in August 2018. Photo courtesy Library Company of Philadelphia. For all the tragedy and sorrow in the American empire, America is a tapestry that is incredible in its depth, and that needs to be noticed and reconciled. … It’s truth and reconciliation that I can do in the way that I know how as an indigenous writer—through a comic book,” said Lee. By now, you’ve probably seen at least one video of a confrontation at the Lincoln Memorial Friday, Jan. 18, between white male high school students and an indigenous elder. As mea culpas continue from journalists and other media personalities who accused the boys of racism and bigotry before videos taken from other angles appeared online, I find myself examining whose version is being accepted as the truth and wondering whose perspective will be preserved as such. My initial reaction was threefold: unsurprised at the behavior of the teens, moved by Phillips’ tears, and smugly satisfied that a Native American elder gave a first-person account and that his account was the one the media ran with. His voice was the voice of the incident, and his voice was heard all over Twitter. He owned the story. There were new videos from new angles and different timeframes. Then came the relief that this young group of Trump supporters couldn’t possibly have been disrespectful (at best) and were, in fact, the victims of overzealous retweeters—relief masked as retractions and analysis that the scene was more complicated than originally understood. Then came the Today show interviewing Nick Sandmann, the smirking teen, Wednesday morning. Thursday morning, nearly one week after the confrontation, Today returned to Phillips. But I want to stay on Saturday for a minute, because in the historical record, in the pamphlets, newspapers, broadsides, and political cartoons preserved from the Colonial, Revolutionary, and post-Revolutionary eras, it is extremely rare for an indigenous person’s perspective to be the first or main story the broader public hears, and rarer still for that voice not to be filtered through whites—whether they were combatants or allies. Nathan Phillips got the chance on Friday and Saturday to tell what happened, but he wasn’t reduced to a narrator of the viral footage. He was an elder, an activist, and someone who felt led to use prayer and a blessing song to navigate the racial tension he observed between groups of black and white males at the Lincoln Memorial. His humanity remained intact. A full picture of Native folks’ humanity, too, is rare to find when looking for Native voices in the historical record. 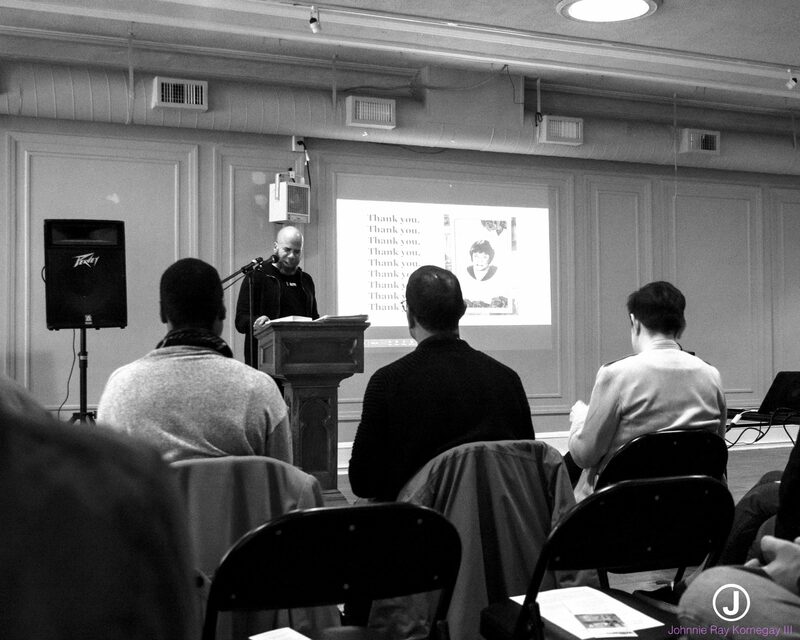 So much of what historians depend on to research and understand the past was written, and as Black Futures Lab co-founder Rasheeda Phillips said at one of our listening sessions, remembering persons and events in writing hasn’t always been the tradition of communities of color. Even when historians want the perspectives of people whose lives haven’t traditionally been preserved in the archives, this methodological difference poses a challenge. In a digital age, however, a conversation, story, or family history that ordinarily may have been passed down orally might appear on Twitter or Instagram as video. (Quick sleuthing suggests the video I saw in director Ava DuVernay’s feed was reposted from Instagram user ka_ya11, a user who identifies as a member of the Dakota nation. Notably, social media platforms often are the way people of color amplify one another’s work and perspectives.) These digital platforms are their own archive, and traditional news platforms turn to them to find and substantiate news and opinions. Monday through Wednesday of this past week, news outlets returned to privileging voices, experiences, and accounts that were white, male, and—given that the students involved attend a private school—wealthy. Did the media simply give a more balanced view by giving Sandmann a chance to share his side of the story? In a world where colonialism, genocide of Native peoples, and their imprisonment in religious schools never happened, yes. In the world we live in, the world where it did, the media simply rushed to absolve young white men (and their chaperones) of collective responsibility and individual malice. From an archival perspective, they repeated mistakes of collectors of the past, even when they didn’t have to. That is how ingrained within America’s DNA white supremacy is. But in 25 to 100 years, what will hold more weight to people looking back at this moment—viral, instantaneous postings, the next-day regrets of experienced journalists, or Nathan Phillips, an indigenous man, in his own words? 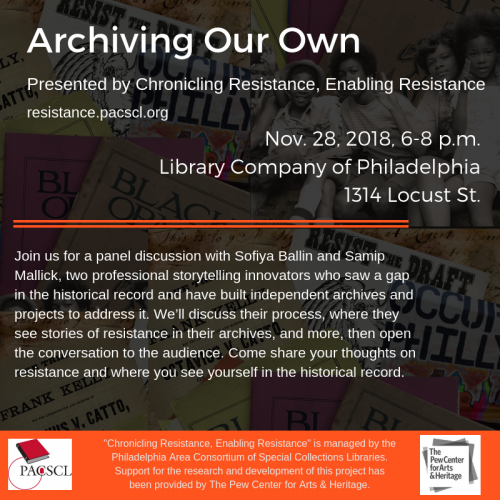 The session “Archiving Our Own” was held November 28, 2018 at the Library Company of Philadelphia. 26 people attended presentations by Sofiya Ballin and Samip Mallick and then discussed their thoughts about resistance and archives. The event was designed as a conversation among project director Mariam Williams, Ballin, and Mallick. 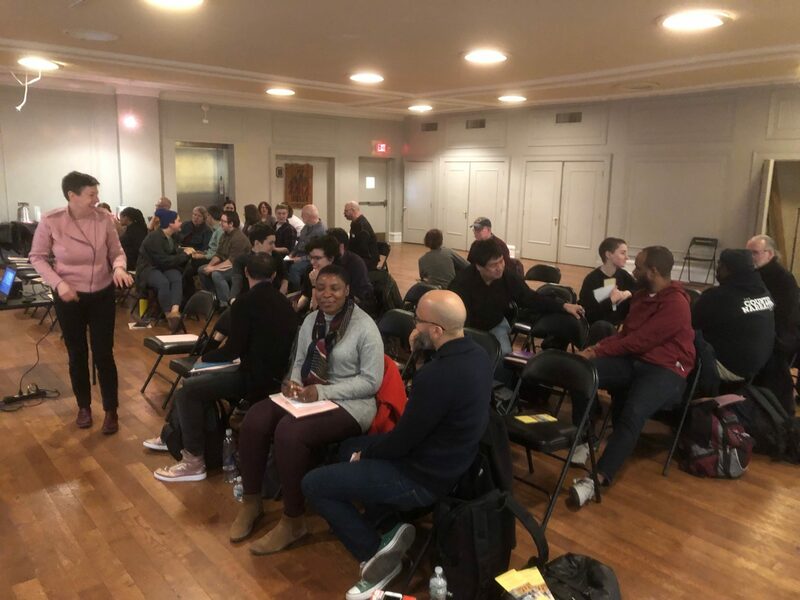 The wide-ranging discussion covered a variety of topics including definitions of resistance, how the presenters’ projects affect people in Philadelphia, the relationship between resistance and archives, and the speakers’ connections to the historical record. Both Ballin and Mallick emphasized the importance of seeing your stories and the stories of your community represented in the historical record and in the narratives told about history. In discussing why she started her project Black History Untold, Ballin talked about wanting to move beyond the “traditional” profiles of black heroes she was asked to produce as a journalist and to show examples of Black success. Mallick reflected on how he felt displaced and left out of United States history when he was learning it in school, and how transformative learning about South Asian American history was for him. The South Asian American Digital Archive (SAADA) was an attempt to rectify this, and to make sure other people did not have the same experience. Both panelists emphasized that they see the work they are doing as corrective and restorative, and that saying “we are here, we have stories” can be a form of resistance. While both Mallick and Ballin carry deeply personal experiences of isolation and ostracization into their work, each also attested to the collective effect omission and sometimes physical separation from archival records has had South Asian and Black diasporic populations. Mallick noted that SAADA tries to highlight stories of marginalized voices within the South Asian American community, such as those from the Caribbean or undocumented immigrants. Ballin emphasized the importance of allowing black people to tell their own stories, which can be seen as threatening, as a way to take back some of what was stripped away during the slave trade. While both speakers emphasized the importance of resistance, they also cautioned that everyone thinks they are resisting, even if they are in a position of power, and that it is important to examine the term and its uses critically. Following this discussion, attendees reflected on the questions: What does resistance mean to you? How do you see yourself in Philadelphia’s resistance history? Who are your Philadelphia resistance heroes? and discussed them in groups. (Group members have been kept anonymous, and the discussions are not transcribed.) Some prominent themes to emerge from the groups were the inherent violence of omission, the ways that things like racist or colonial art on the walls of institutions may deter the public from using the archives, the importance of knowing your own history, and how the preservation of history from non-dominant groups can be difficult in a multiplicity of spaces. Sofiya Ballin is an award-winning journalist, writer, curator, and storyteller forging new roads in digital journalism. 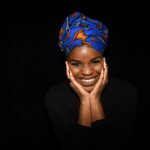 Creator of the Black History Untold project, the Philly-based and New York-born writer has a magnetic personality and natural charisma that’s evident in her work and online presence, bringing new energy to the field. “All my life, I’ve learned that there were stories untold and that not every legend was etched into bronze, my goal is to tell their stories,” Ballin said. Her allegiance to those untold stories has led to some of the most poignant work in her career so far. Ballin’s series #BlackHistoryUntold was birthed from this idea and led to her identity series that explores the importance of a comprehensive Black History education through an array of powerful essays. Winning the National Association of Black Journalist (NABJ) Award for Best Feature: Series in 2017, the project served as an opportunity to work on something bigger than herself and has included Jesse Williams, Marc Lamont Hill, Cory Booker, Black Thought and Jazmine Sullivan, among others. Ballin is dedicated to the work of telling the stories of others, that might otherwise be overlooked, in the midst writing her own. 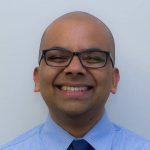 Samip Mallick is the Co-Founder and Executive Director of the South Asian American Digital Archive (SAADA), the only organization that digitally documents, preserves, and shares stories of South Asian Americans. Working at the intersection of technology and storytelling, Mallick has a bachelor’s degree in Computer Science from the University of Michigan and a master’s degree in Library and Information Sciences from the University of Illinois. He was previously the Director of the Ranganathan Center for Digital Information at the University of Chicago Library. In September, several members of the Chronicling Resistance steering committee attended the Annual Meeting of the Greater Philadelphia Cultural Alliance. 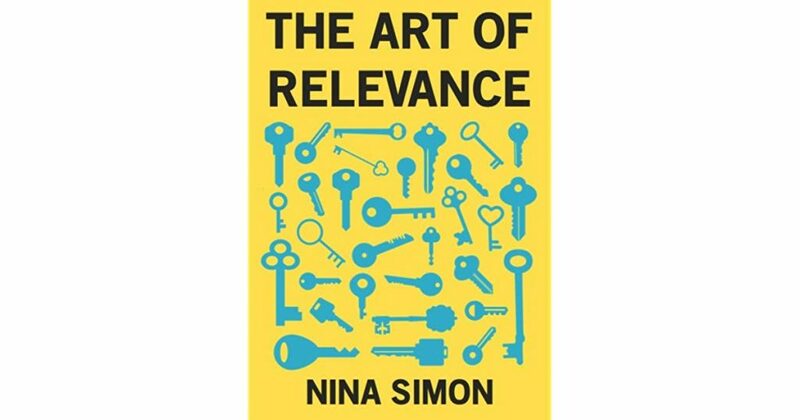 There we heard a keynote address from Nina Simon, Executive Director of the Santa Cruz Museum of Art & History and author of The Participatory Museum and The Art of Relevance. Based on her second book, Simon’s keynote address (much like this TEDx Talk) gave leaders of various organizations and institutions a crash course in “how to invite people outside of their traditional circles, into that thing that matters to [them].” In other words, she answered the following question: how do you make a place, issue, cause, art form, business, etc. relevant to people who currently, for whatever reason, don’t care about it, don’t know it exists, or don’t think it’s of any importance to them? Who are archives important to? With whom do narratives of resistance resonate? The answers aren’t necessarily two different constituencies, but one group may, to paraphrase Simon, look at the front door to an archival institution and see a systemic lockout while the other may look at the same door and feel like they are about to enter their own home. I’m closer to the latter group. For most of my life, I’ve had the ability to nerd out and go down rabbit holes of documents and files just because it’s interesting. On the other hand, I also know what it’s like to enter a place built in the 1800s and have an archivist who’s certain I don’t know protocols about food, beverages, pens, and bags watch me closely as I do my work. Such an archivist’s behavior (and such necessary rules) aren’t ones everyone can tolerate. But it doesn’t mean the stories inside the archives wouldn’t be important to them if they knew they were there. It may just mean, as Simon suggests, the effort it takes to get into those archives and draw meaning from them isn’t worth it to everyone. And it may mean we have to build a door that they think will be worth going through, a door that opens to something meaningful for them. What does that door look like? What does the invisible “Welcome” mat outside look like? That’s the question I’m wrestling with. With a group of consultants we’re calling Thinking Partners, the Chronicling Resistance staff and steering committee is attempting to construct those doors and welcome mats for communities whose voices of resistance may not have been heard clearly enough by the people who have used the archives to write their stories, and for communities who are still trying to tell their stories in their own ways. Simon encourages “community-first programming, using a community’s assets and resources to build a project together.” Listening to the community’s wisdom and then adapting existing doors and spaces rather than prescribing what they should look like–because honestly, we don’t know what they should look like. We, the historians, archivists, and academics who are degreed and skilled in what we do are not the experts in this project. For the next several months, Chronicling Resistance staff, steering committee members, and consultants will be attempting to construct new doors and welcome mats for communities whose voices of resistance may not have been heard clearly enough by the people who have used the archives to write their stories, and for communities who are still trying to tell their stories in their own ways. I’m excited to look to people whose histories, stories, and contributions often have been undervalued and call them experts.